I just tagged v2.0-beta! This is a preview of the next generation of this addon. You can see the new and improved layout of the tooltip, as well as better options for showing and hiding characters and instances. You can even change the order that the instances are listed in! Things to note: I haven't got instance IDs or expiries displayed on the tooltip yet. This is definitely something I want in there, but I'm still unsure as to how exactly we want this in there. My main idea at the moment is to have a "details" checkbox that will toggle both expiries and IDs. In the tooltip, you'll see Normal and Heroic IDs in the character's column, on separate rows. This means we have 2 rows per saved instance. So there's room for the expiries in the the row beneath the name of the instance. I'll do some raiding with my guild this week and then try out a few of these ideas and see how they look. I'm very open to suggestions at the moment, too. And of course, feedback on how 2.0 is shaping up is very welcome. Thanks! Currently getting an error when I run it. While I play with stuff and try to figure out what's causing it, I figure I would post it here. I'm sure it's just me though. It only happens the first time I open the window after loading a character. SavedInstances: You must be attached to a panel. I picked up the 2.0-beta2 version. Try locking your FuBar. Pretty sure that'll fix it. Aside from that, how's it working out? Did you use previous versions? Do you miss Instance IDs? Suggestions? Well, just now I tried to open up the Fubar config and that errored. Might have been related. Fubar has never errored for me before. I'll look into that while I try to find the lock thing. Anyway, I love the mod. I can't tell you how many times I wish I could know what my other characters were saved to without having to logout, log back in and check to find out that he's saved. I haven't used any other versions of this or even any other mods like this before. As for Raid IDs, that would be pretty sweet to have maybe in the config window somewhere. The way the mouse-over is right now is perfect, adding ID's in there might make it too crowded, not sure. But knowing what ID my other character is saved to could be useful. Maybe make it an option to show ID's or not so people that need to can check and it's out of the way for the rest. Okay, I've gone and released v2.0! The one little thing I slipped in since beta2 was a method to see instance IDs and expiries in the tooltip. If you are holding Shift before you mouseover the icon and see the tooltip, then you'll see the IDs. If you are holding Control, then you'll see the time left. You can release Shift/Control as soon as the tooltip is shown and the extra info will remain. It's sort of hard to explain, I guess, and it's a bit dirty. Still, once you get used to it I think it works really well. This seemed to be a fairly flexible, if not terribly accessible means of getting showing these details, since you can do anything you like once the tooltip is up (except move the mouse) and you can still see them. Locking the Fubar panel fixed the error when opening the config. Just picked up 2.0 as well, works great. Having the different info on ctrl-mouseover and shift-mouseover is perfect. In the day I've had the mod I've used it a more than a couple times. Holy crap that looks terrible. :( I don't suppose you can send me your SavedInstances.lua file from your WTF folder? PM with an attachment, or even attach it to a post here? It'll be easier if I can reproduce it here. Thanks, and I'm really sorry that messed up for you. Some change made between revisions 58 and 64 of LibFuBarPlugin-3.0 seems to be preventing SavedInstances from displaying its FuBar information. I tested rolling my UI back to a point when I knew I'd had the FuBar display (and options) as well as rolling back and foward the various libraries and add-ons I'd updated in the two day gap I'd narrowed the FuBar text/icon's disappearance to. Haven't gone so far as to test each revision between those two, though. I'll try to have a look into this. I may just end up bowing to pressure (from all the other authors) to just ditch FuBar support and get you guys to transition over to Broker2FuBar. Maintaining good FuBar support is one of my goals, but if Broker2FuBar handles it better then it might just end up making more sense. Okay, so I'm doing some work on SavedInstances today and I'm dropping FuBar support. :( I know one of my initial goals with this was to maintain support for FuBar, but it was adding some general ick. If you are looking for an LDB alternative, then I personally use and recommend DockingStation. Or you can try out Broker2FuBar if you aren't ready to abandon FuBar just yet. I'm really sorry about this guys but a rolling stone gathers no moss (or something). I just fixed that silly tooltip duplication bug with DockingStation. And you can now choose whether new instances are set to always-show by default (or not). v2.1 should be released today. Ah, this isn't a DockingStation bug? What was the problem, then? Broker_Currency has the same issue. Well, it IS a DockingStation bug, I just use the workaround. Turns out DockingStation's tooltip scale feature requires 2 OnEnter firings to get the tooltips right. I think Vrul will drop the feature if he/she can't get the OnEnters back to 1. In the meantime, I just check to make sure that the tooltip contents are only shown once per Show->Hide cycle with a flag. Also, v2.1-beta3 uses the WowAce localization stuff. I figured it was about time I did this. You guys can help with translations here. Okay guys, v2.1.3 went out last night (and should hopefully be on Curse). I had a silly mix-up with one of the files in v2.1.2 which is why that version was superceded so quickly. 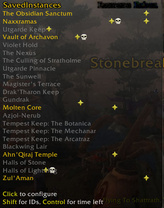 v2.1.3 brings options to change the Normal and Heroic indicators in the tooltip. You can choose from any of the raid target icons, as well as use your own custom text (with custom colouring). I just went and filed a whole bunch of tickets. Go take a look at them, vote either way for them, and make comments (especially against the ones that are "Waiting"). Once my assignments and exams are out of the way in a few weeks, I should be able to work on this and we'll see some new features. Okay, so even though I should be studying, I went and pushed out v2.2.0 of SavedInstances. I've embraced LibQTipClick-1.1 and I think everything is behaving nicely. You can mouseover the indicators in the tooltip, and you'll get a secondary tooltip showing the instance IDs and the time left (expiry is only shown once if it would just be a duplicate). I've removed the "hold shift" behaviour, since it was ugly and just a stop-gap. Instance categories or maybe saving fellow members or bosses will be next. I haven't decided. All choices lead to further complicating the SavedVariables format, so I'll be treading lightly.